Dudes! I gave birth to a beautiful baby boy. So many pictures, it's hard to pick the one I want to show off. 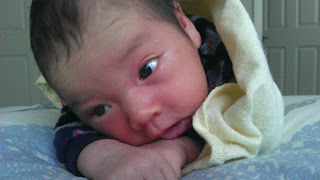 But motherhood is tough - and time...is limited. 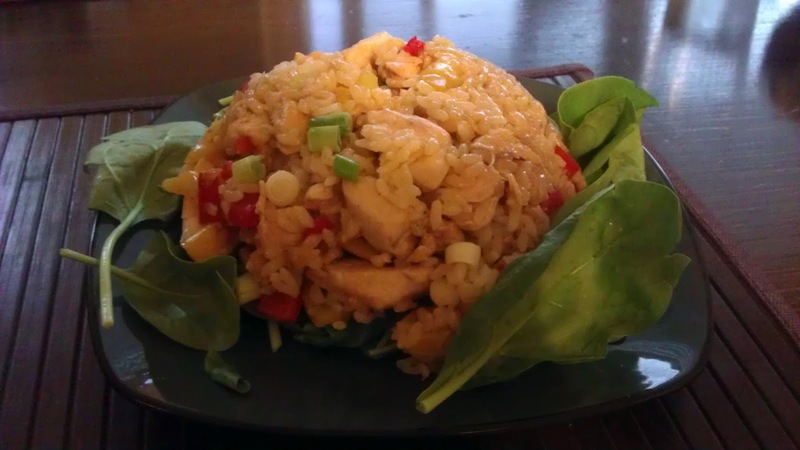 So - I finally found time to post one of the recipes I use to cook a dinner for me and my baby daddy when he's able to watch the baby. It takes 30 min start to finish. Pictures may happen next time I make this dinner. For now, just use your imagination. Plus, my baby is cuter than pork chops any day. In a saucepan on low heat, melt the butter, and add garlic and onion. Add milk/cream and simmer until bubbling while stirring occasionally to prevent the milk from burning. Season with salt and pepper and add the flour to thicken the sauce to desired consistency. Add mustard and stir evenly. If you want a smooth cream sauce, strain the sauce to take out the onion and garlic. Coat the pork chops with olive and season with salt and pepper. On high heat, fry the pork chops until browned. Wrap (tent) with tin foil and place in a preheated 250 degree (toaster) oven for about 15 minutes (or until done). 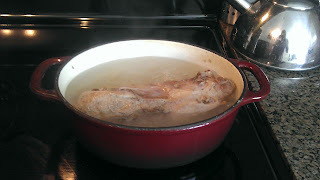 While the pork chops in the oven, using the same pan, heat up butter and duck fat on medium to medium-high heat. Place a layer of potato slices in the pan, avoid overlap. Season with salt and pepper, herbs de provence and fry until golden brown, then flip and fry up the other side. Repeat with rest of the chips if needed. Peel and cut yam into 1 inch oblique pieces. Soak yam pieces in water for 10 minutes. Drain lightly (keep moisture in the yam - so it may steam). In a pan, add butter, sugar and yam pieces. Turn burner to medium-low and cover. When it starts to sizzle, mix the yams and sugar mixture to coat evenly. Turn over pieces to evenly brown each side and cover, continue to steam while frying. Continue frying, turning over pieces to brown each side evenly. When the pieces can be easily pierced with a skewer, they are done, and you can continue to fry uncovered until the outside matches your desired crunchiness. When done, transfer to plate. Use slice of Pagnotta to wipe up excess caramel in pan and immediately wash pan (sugar is impossible to clean when cooled). 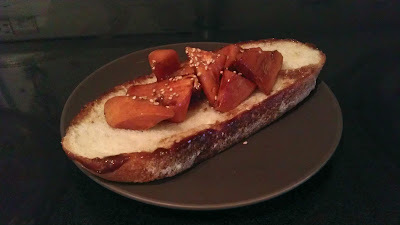 Serve yam on top of soaked pagnotta slice, and garnish with sesame seeds. Eat up! Yum! :) It's heavy, full of sugars and starches and can make one gassy...so go easy! Leftovers - what do you do? So - a lot of times - I will have lots of leftover ingredients. A rotisserie chicken...some cheese that is starting to grow other types of mould...a wilting tomato...part of an onion. All these can still be used... and not just in soups or stock. Given I tend to always have $1 pizza dough balls on hand, and a pizza takes only 5 minutes to make, I just go to my brain and ask: What would go well with chicken and tomatoes? Answer: The ripe avocados of course. However, without pizza sauce and limited time, I ended up making a pretty flavourful one myself with a magic bullet. Preheat oven to 500 degrees, with pizza stone on lowest rack. In a magic bullet (or food processor/blender) combine all sauce ingredients. Adjust spices to taste. When it tastes just a bit stronger than you prefer (the sauce is spread out thin), add a little cornstarch to thicken and microwave. Spread sauce on pizza, add tomato, onion and chicken. Top all with cheese. Bake for 5 - 10 minutes, until crust is golden brown and risen. 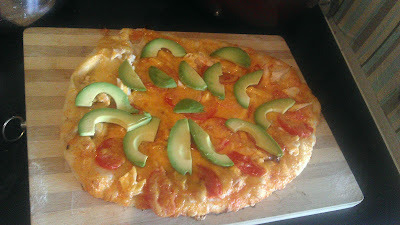 Remove from oven, add avocados last. Let sit for 5 - 10 minutes, and serve. One of my favourite protein snacks is agedashi tofu...a comfort food for me. (85g of tofu = 7 g of protein). It's also really cheap ($1.79/700g at Superstore, probably less at a Chinese Supermarket). Shichimi seasoning (optional, I'm not a fan). Cut tofu in half and wrap each half in paper towel, and set aside for 30 minutes, to make sure tofu is mostly dry. Prepare stock: Boil dashi stock in water and set aside. Heat oil in a pan. 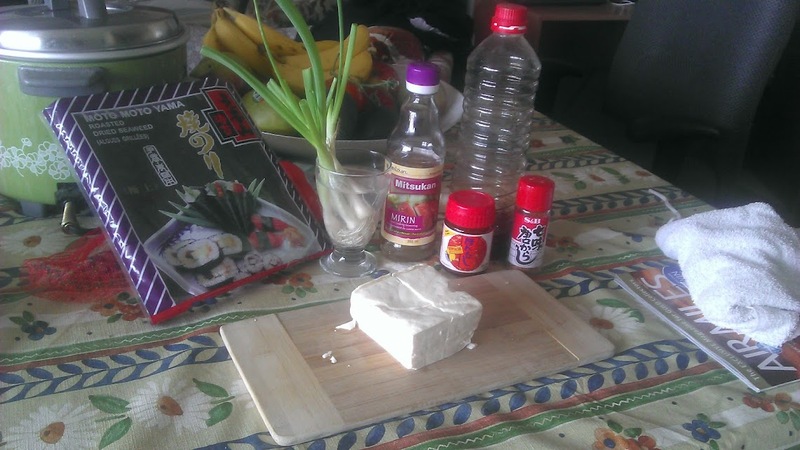 While heating oil, you can chop the green onions, and even use scissors to prepare the seaweed. Boil the mirin in a small pot until all the alcohol evaporates, then add the stock, and then the soya sauce. Bring to boil and immediately lower heat and set aside. Now that the oil is hot, prepare the tofu. Cut the tofu into 1 - 1 1/2 inch cubes. Dry each piece and coat evenly with a thin layer of cornstarch (dipping them in a plate or a shallow bowl of cornstarch works). Fry the cubes in the oil, being careful to keep them separate. Turn to fry each side evenly, until a crispy crust forms. Cool the tofu cubes on a drying rack. Warm up the sauce once more. 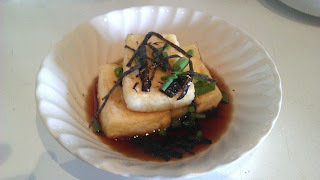 Serve tofu with sauce, garnishing with green onion and strips of seaweed (I cut them with scissors). Other garnishes can include: grated ginger, grated daikon, bonito flakes, etc...experiment with your favourite flavours. While I'm not a vegan, I play one on TV. Well I don't, but Brandon Routh (or Christopher Reeves version 2.0) does. I mean, I've learned two things about veganism from Scott Pilgrim: 1) being vegan just makes you better than most people (e.g. one of my "ginja ninja" climbing buddies, with amazing climbing skills and wicked upper body) and 2) being vegan gives you psychic powers. Figure 1. "Being vegan just makes you better than most people." when following the Vegany Code. WARNING: The fibrous power of vegetables and fruits should not be underestimated, and under no circumstances should one try the following, unless they're already on the toilet. Figure 2. Yeah. That's right. I love bananas. And I love avocados. I eat them straight up. So obviously, they must be combined into a superfruit! 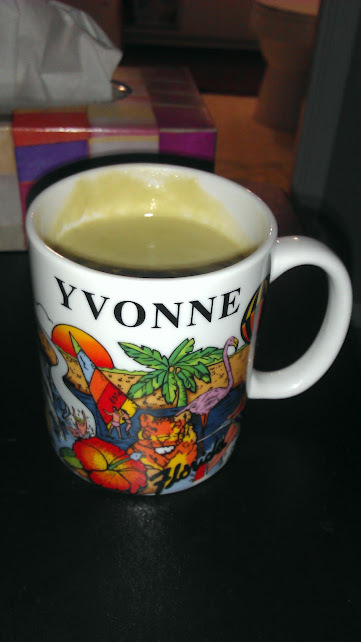 Combine banana and avocado in magic bullet, cover with almond milk. Blend. Add more almond milk to adjust for texture. 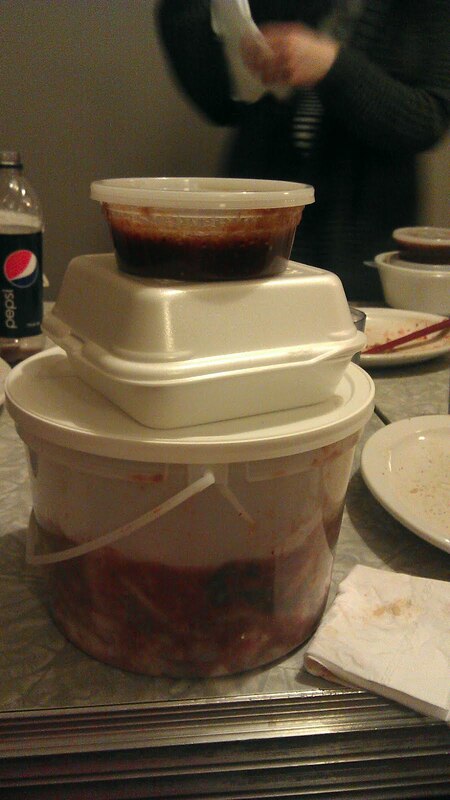 Maybe I shouldn't have had two of the four servings to myself. (see Figure 2.) 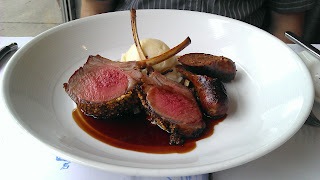 The texture was the equivalent of drinking heavy cream. And the gastrointestinal result was similar (to me, since I'm lactarded). The sweetness was completely dependent on the ripeness of the banana and the sweetening of the almond milk. It wasn't very sweet at all, but I think I would use UNSWEETENED almond milk next time. It feels like the sugar excarbated the following effect of: being so excited I couldn't decide whether to blog this, or to go straight to the washroom. Veganism is often touted as difficult to follow as normal recipes that use dairy (milk/butter) and eggs are hard to imitate (i.e. baked goods). This composition of avocado and banana simulates the exact texture of heavy cream, with little added flavour. But how does baking affect the texture and composition of the resulting baked good? Further research (into vegan recipes) will solve this, and future studies will attempt to repeat the creation of the best vegan chocolate cake I have ever had, a light and moist cake that was served by Fresh in Toronto, with the creamiest icing (2006). Avocado is suspected to be the base ingredient for the fat composition in said cake. Well, it turns out my black thumb isn't so black after all. Maybe there is a reason why people use the term "Mother Nature" instead of "Father Nature". Now...I don't aim to be heterosexist or heteronormative...rather I think this is one of those smug pregnant women moments. In my youth, my impatience with all things showed especially when I was required to be responsible. I have tried to look after plants and small animals, usually with the result of death. The smaller they were, the quicker they died (an african violet, guppies, a baby garter snake, a beta fish, a hamster...). I didn't mean to kill them, in fact, I really wanted them to live! Note how the green onion shoots are actually growing? But now, just starting out with my first mummy tummy (and the associated waddle), I just wanted to see if I could regrow spring/green onions tops for cooking....I'm having a lot more success, and working a lot more carefully (cutting off the dried parts while making sure that the stems all have access to water). First attempt (pre-pregnancy), spring onions wilted and died in a day. Second attempt (first trimester), spring onions kept well in fridge for about 1 month. Pretty impressive. I didn't think I could have done it. 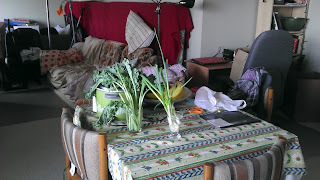 Third attempt (second trimester), the spring onions are now outside on the kitchen table, basking in sunlight. They started growing tall and strong! And smell delicious! After that, I thought, maybe I could try this with my kale. They're kind of wilty now, but when I went back 2 hours later, one of stalks had stiffened up. I'll keep you posted. Perhaps, growing a life form inside yourself makes you value life around you a little bit more. Life seems more "equivalent". No one species is more superior, just as no person (child or adult) is more superior than another. Each person, animal, plant, bacteria seem to have a special role that helps the lifeforms around them survive....and hence the term "Mother Nature", in which that motherly role of something (the earth, the climate, etc...) is mothering of all the species around it... and perhaps any person who values another being of another species or class or age (whether a mother, a pet owner, a friend) might find this value in life as well! Longer wait = more flavour. I didn't add tea this time, didn't want the caffeine. But normally, if I make a cup for another, I'll reuse their teabag in mine. Less caffeine, still lots of flavour! When I was a child, I loved when we harvested strawberries, and then made strawberry juice...not by pureeing or blending, but by steeping them in hot water for an hour, adding honey or sugar and then letting it cool. Of course, my mom would overdose the pitcher with sugar to add sweetness, but nowadays, a teaspoon of honey in a cup will do. Experiment with any fruits you think might taste awesome. 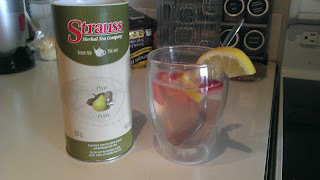 Optional: Strauss Pear Green Tea from the Italian Centre - I often buy them on sale. Boil water. Wash and cut strawberry and lemon. Squeeze a little of the lemon into the cup if you want more lemon flavour. 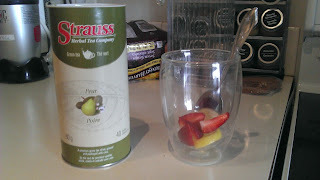 Add strawberry and tea bag and spoon with honey. Pour hot water. Mix honey into the drink, let steep for a few minutes. Experiment with other fresh fruits and teas - like pears, apples, mangoes, the parts of the pineapple you won't eat. There's even a mandarin black tea at the Italian Centre. I even have a french press I use sometimes to make large cups of tea + fruit. Melt butter in frying pan (with lid) on medium to medium-high, when the butter starts melting, add wet asparagus (the water will steam it). Squeeze the juice of one half of the lemon slice on the asparagus, reserve the other half for garnish. Throw the squeezed lemon in the pan for more lemony flavour. Top with dried dill. Cover and steam for about 10 - 15 minutes, or until the asparagus is the brightest green you get. Remove from heat, then serve, garnished with the other half of the lemon. Asparagus is totally in season. 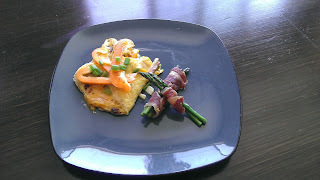 And as such, I love steaming my asparagus, but I find it takes too long with my rice cooker or baking it in the oven. I love slow cooking, but I like to do it fast, so I do a quick steam in my frying pan. I plan on using this with the frozen salmon I have in the fridge. :) Yum! Butter fried salmon with lemon and dill. Yeah! 1 pan dish, butter seasoned with lemon (I just fried the lemon slice in the butter), and fried up salmon seasoned with S&P with lemon juice). I took the lemon slice and wiped it all over the salmon. 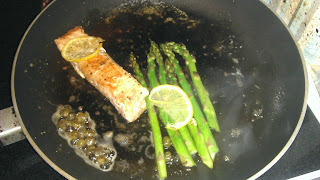 Then added the rinsed asparagus and some drained capers after salmon was just about cooked, sprinkled generously with dried dill, and topped each with a lemon slice and steamed. Dishes: minimal! Pizza, the bachelor way. This recipe is quicker than a frozen pizza with a little forethought (i.e. taking out the dough to defrost it). And seriously, it's pretty classy to say: "I hand-tossed this pizza, because you were coming over, and I wanted to make something special." In actuality, pizza is my quick&lazy goto meal, because you can dress it the way you (or others want) and it only takes about 5 minutes to cook. Preheat oven with pizza stone on lowest rack to 500 degrees. On a large wooden surface (I use a wooden cutting board), flour surface. 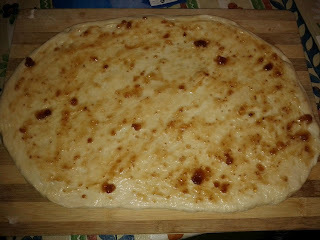 Roll or toss pizza dough (http://www.youtube.com/watch?v=HWL__9yDu8I) into a large flat sheet (as thin as you like). *IMPORTANT*: Make sure that before topping, that the pizza easily slides around on the board, if not add more flour on the bottom. Coat the edges of the crust with olive oil. Spread fig spread or jam over the crust (sparingly if you don't like it too sweet). Add thin slices of duck prosciutto and proscuitto. Add goat cheese (I used feta, and you can be generous if you want). When oven is preheated, slide pizza onto hot pizza stone. Bake for 5 - 10 minutes (or until crust rises a little, and becomes golden brown). I topped mine with lemon-dressed spinach after baking. 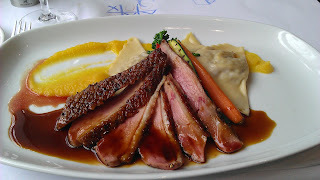 So - over the weekend, I went to my first food conference: the 2nd Annual Eat Alberta Conference. 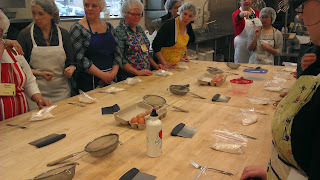 I learned to make macarons, ricotta cheese gnocchi, and pasta! Pasta is pretty easy, but takes lots of hard work. Usually it takes 1 egg to 100 g of flour. And then ton of kneading. This was such a simple recipe. 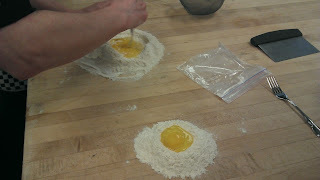 However, I choose NOT to roll it out into pasta (tagliatelli) myself, and chose to keep it to make into ravioli. I was inspired by Daniel Costa, at Corso 32, who made a ravioli with an egg yolk inside, which, when you cut into it, would leak out....it was amazing. Best flavour ever - subtle and delicious. See what I did there? 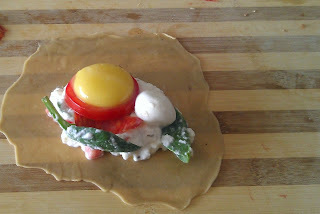 :) There's tomato, soppresetta, bocconcini, and an egg yolk. And man... I made the ugliest ravioli ever. But I served it with a butter sauce, with garlic, shallots and sundried tomato - thickened with crushed walnuts, on a bed of spinach. It tasted good though. 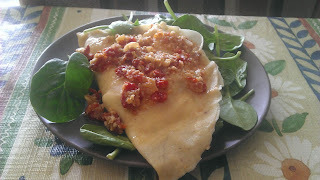 Inside the ricotta filling was sundried tomato, roasted garlic and herbs de provence, as well as the soppresetta, tomato and bocconcini. Well worth the attempt. Tomorrow, I'll be using the rest of the filling, perhaps in little tortellini if I feel the urge to procrastinate. It's time to revamp my style. Being pregnant has its drawbacks. Having been athletic and slim, it's kind of unnerving to hear a rip, then feel a breeze, when I pull on my low-cut pants. My pants don't fit, my tops are too skinny, my formerly buff arms are starting to get flabbier as I tone down my workouts. Maybe it's time to revamp my wardrobe! I've had the same style for over 6 years, and this is a good excuse to make a change! It's a good thing I'm asian. Having pulled off plaid, check, polka dot and pinstripe all at the same time (same colour family), I believe I can pull off a completely revamped style. But I don't want to spend a whole ton of money on clothing that I'll only ever wear while pregnant. That's why I went and spent $280 on clothing from YESSTYLE. It's an american site that stocks asian-style clothing (with influences from Singapore, Hong Kong, Taiwan, Korea and Japan). Yup, elastic waist skinny-pants, long flowing dresses and tunics are perfect for the summer, and contour around my belly nicely. That's the good thing about asian style, with more emphasis on the skinny extremities, and de-emphasizing curves, I don't feel as self conscious in leggings and a dress. The soft girl look can easily be combined with my partner's hoodies and jackets (which they even sell as "boyfriend" style). It's not that I want to hide my belly. I just want to look pretty while I show it off! I mean, just because I can't afford to be a gourmand, doesn't mean I can't dress like one! Photo credit: These pictures are taken off the YESSTYLE site. But seeing as I'm advertising them, and giving credit, I'm sure they won't mind. Plus, the model is WAY cuter than than me. Siu To - owner of Noodlemaker here in Edmonton, held a Korean culinary workshop on Tuesday in which we learned to make medicinal chinese chicken soup, korean bbq sauce, bulgogi and kimchi. I ended up taking home a half full ice cream bucket of kim chi, enough to last me until next year! I figure I should start documenting this before this fades and I forget. Mix them all, and blend with a hand blender. Add to prepared cabbage (below). Siu Choy (Chinese Cabbage) or Napa Cabbage, thinly sliced and salted overnight, then washed with warm water. (Or you can use your local cabbage as well, such as the flat dutch cabbage sold at Riverbend Gardens). Fermentation: Let sit for 48 hours, with a small opening in the lid, until bubbles start to form, then cover and refridgerate. Apparently if you ferment too long, it'll just bubble over. Sounds fun! Roast 1 part sesame seeds until browned. Add to mixture and blend. Lesson of the day: These are just basic recipes. 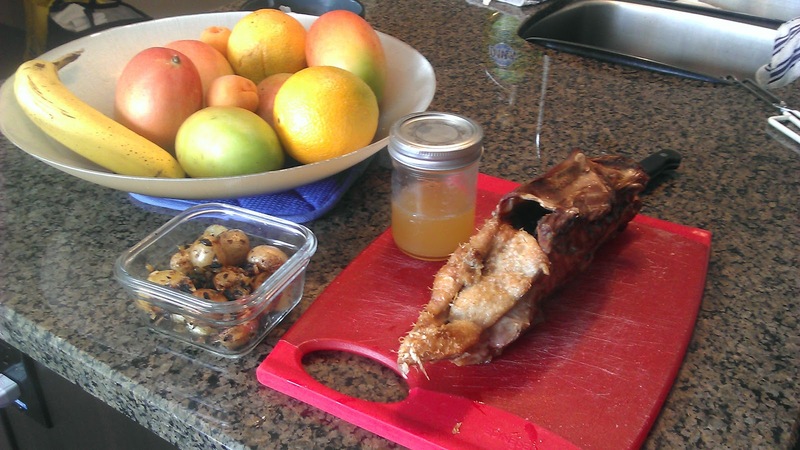 You can add anchovies to your kim chi or whatever you would like to your Korean BBQ sauce. Like all "recipes", you alter the ingredients according your personal tastes. I don't use recipes, I just tend to use guidelines and alter as needed. Oh, and I'm getting a used hand mixer from a friend for only $5! WOOT WOOT! My first trimester cravings included tuna (raw or cooked), all noodle soups, and of course, pickles (the sweet Bicks, the pickled daikon, and kim chi). Is that odd? Anyways, after spending a ton of money at Noodlemaker and Nomiya, I thought it might be cheaper to buy and make my own noodle soup. I already had miso, kelp, some hondashi fish stock, and anchovy paste for the base. I also always have eggs, and various veggies in the fridge (carrots, broccoli and onions). So cheapest thing to do? Buy packages of udon from Superstore for $0.67 or $0.87, and make my own soup. 1 tsp of hondashi fish stock (or if you don't like the msg, can omit or substitute 1 tsp anchovy paste ). 1/4 of a full sheet of dried kelp. In a small pot of water, dissolve soup stock or anchovy paste, add kelp and diced veggies, and bring to boil. Reserve your miso until the end (otherwise all the flavour will boil away). When soup is at a rolling boil, gently add egg and cover. Boil for 3 minutes, then add fresh udon noodles, and continue boiling for another 3 minutes. Remove egg and rinse under cold water before peeling. Add miso paste, and dissolve in soup. 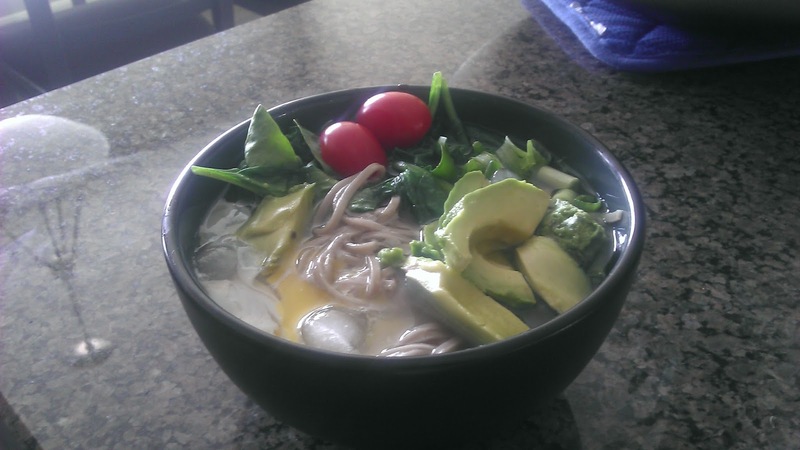 Serve soup and noodles in bowl, and decorate with your veggies and egg. Add sesame oil, sesame seeds, seaweed, shichimi seasoning or any other random asian toppings you may have to taste. Enjoy! I sure as heck did! In a bowl, whisk EVOO and acidic liquid (lemon juice or vinegar) until it makes a vinaigrette. 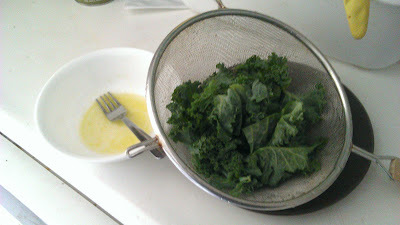 Toss kale until coated. Season with your choice of seasonings to taste. Bake at 450C for 5 minutes, or dehydrate (either in a dehydrator, or in the oven at extremely low heat). I hear that dehydration is much healthier, only I did not have the time. When I found out I was pregnant (right before my first miscarriage), I went to a friend's party, and she made kale chips in her oven! Incredibly convenient and incredibly tasty, for some reason I couldn't eat enough. I highly suspect it may have had something to do with the baby draining the folic acid, Vitamins A and C, etc... that's all found in kale. 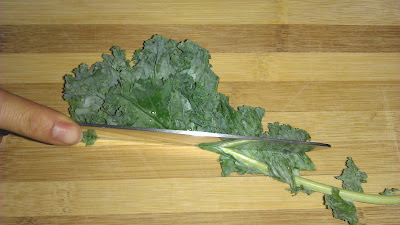 Kale - it's so bitter when raw. It's cheap ($1.29/bunch at Superstore - thanks for the tip ginja ninja - but buy organic to cut down on pesticides). It looks kind of weird when dry on the shelf, and when it gets wet, it still looks weird. But those curly edges are the BOMB when they crisp up.Now, having to rinse, wash and dry a whole batch before seasoning, and putting it into an oven that needs 10 minutes to preheat, that's totally inconvenient. Ovens waste so much electricity! This morning, I was nauseated from not having eaten, and I didn't want sugar-y breakfast foods, or a carb loaded/sodium heavy bunches of saltines, and I craved a little crunchy salty goodness. I didn't want to use that much electricity, so solution? TOASTER OVEN! We have an awesome cute toaster oven (I think it's my roomate's). It's efficient, it takes 1 minute to preheat to 450 degrees, and it takes 5 minutes to dry the kale. So I only made a tiny batch, cutting the leaves straight from the stem by folding them in half, and making a diagonal cut (1 cut instead of 2!). I rinsed and dried them in no time, seasoned with a little olive oil, sea salt and pepper, and then lay them out in a single layer on the tray. I baked for 5 minutes, and then ate. Took a whole 10 minutes to get this snack into my preggo belly. I think the baby rolled over a few times, I apologized to it for the initial bitterness (I can't imagine eating kale and then breast feeding...) but then I ate the whole batch in without taking time to sit down. Being pregnant, and having an athletic boyfriend, sometimes we require snacks to sustain ourselves between meals. If you're hungry, craving a little salty and sweet, as well as protein, this fatty dish will satisfy you for a while! A little goes a long way (I go for small portions with big flavour). We shared one old gala apple between two people. Lay out apples on oven safe plate. Wrap or top apple slices with proscuitto. If you like your cheese melted on, top with cheese before drizzling syrup, and bake it. Sounds disgusting? Just hear me out. As a fan of prosciutto (but not so much cold cuts), I find that spending $35/1 kg ($3.5/100g) of thinly sliced proscuitto a little expensive for my taste. Plus, I don't use it all that often (it's so high in sodium! ), so it ends up drying out anyways. I know, some say "Go to Costco! It's cheaper there!". But there's also SOOO much packaging that's wasted! Well, I'm also a fan of "waste not, want not". I suppose seeing traumatic images of starving children in Ethiopia after not being able to finish my dinner does that to me. So - a good way to get prosciutto that'll last forever in the fridge is by checking out the discount meat bins at your local grocer/deli. Sometimes they repackage the ends of their charcuterie when they get too small to slice and sell them at a discounted price (hence discounted meat!). If I go at the right time to the Italian Centre here in Edmonton, I will find a chunk of prosciutto for about $8 - $10. It's a pretty sweet deal. It's uncut, so it doesn't dry out as fast, and instead of being required to eat 9 slices within 3 days, I can just cut the slices myself, and I can cook them into pastas, add them to salads, and even use the slices to wrap random veggies (asparagus) and fruits (pears) for consumption. It lasts up to a couple of weeks in my fridge! 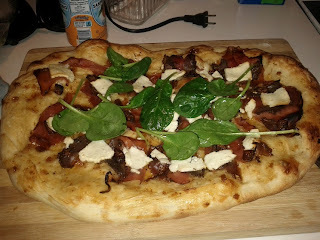 It's pretty classy when I can say "I used prosciutto on this pizza". 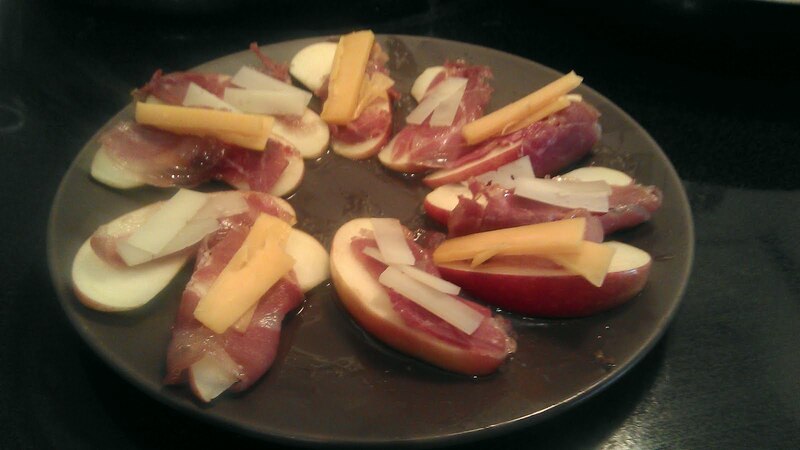 Prosciutto wrapped pears (add a drizzle of maple syrup and toast in the toaster oven for a quick snack). Prosciutto infused asparagus (steam asparagus in pan with butter and lemon and the excess prosciutto fat to flavour the butter, add slices/raclettes of fresh parmesan to top). 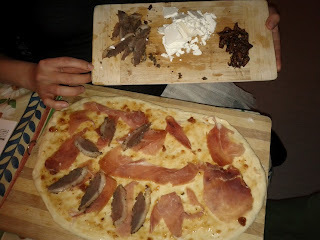 Duck prosciutto and prosciutto pizza with goat cheese and figs. (Buy frozen dough at the Italian Centre in Edmonton for $4/4 dough balls, defrost, and bake on pizza stone with favourite toppings).